Fresh eyes can often bring new perspectives and discover fresh insights, identifying previously unnoticed opportunities, risks and issues. A Fresh Eyes à Fresh Insights analysis of your social responsibility and sustainability programs and projects can often identify opportunities and risks that may be unnoticeable by someone working closely with them every day. The easiest way is to think of it as a quick CSR SWOT. This exercise isn’t about the effectiveness or efficiency of your team and their activities. In fact, our fresh-eyes will see clearer and farther because of the effectiveness and efficiency of your team. Their knowledge, experience and understanding of the issues and situation can help keep our fresh eyes on target at the same time as my fresh eyes help them to new insights and perspectives. A Fresh Eyes à Fresh Insights Analysiswill poke, prod and peek into your CSR projects and initiatives, getting into the field and visiting sites and operations, interviewing key internal and external stakeholders, meeting with current partners and identifying potential new ones. Our experienced fresh eyes will undertake a rapid, 360-degree review of what you are doing and how you are managing social license, CSR, sustainability and other key issues. We will systematically identify opportunities, risks, and other issues and provide a clear value-focused go forward workplan for you and your team to work with. We will also undertake an identification and analysis of potential partners and collaborators with a focus on expanding resources, strengthening capacity and enhancing impact. Go forward plans will be developed for the most promising partnership opportunities. We normally spend 2-3 days at each field/project site meeting key internal and external stakeholders and leaders, visiting project operations and other relevant areas. We look at all relevant aspects including operations, metrics, partnerships, reporting and communications and other areas as appropriate. We then meet relevant leaders in your country office and will spend 2-3 days meeting with potential donor and implementation partners. We will deliver a debriefing report and a final report that will contain our detailed findings, insights, recommendations and go forward strategies and plans, including a detailed partnership development strategy complete with contact names and development plans. Partnerships often represent an opportunity to both deliver and receive additional value from CSR and sustainability projects. They can range from full on execution and resource contributing partners through to communication and socialization partners. Partners can add diversity, perspective, communications reach, stakeholder impact and credibility and, of course human, financial and organizational resources and capacity. While they won’t fit in every situation we often find that a systematic review and assessment of partnership priorities, coupled with the development of a structured means of identifying, assessing and development partnerships going forward can make a significant impact on the success and impact of CSR and sustainability projects and budgets. There are many (often too many) options for reporting and communications and they are key, even critical drivers of success and value in CSR and sustainability programs. Yet, they are seldom looked at strategically in terms of how they can support the societal, corporate and development impact objectives of the program. ons with key stakeholders, or even peripheral observers. Others are best to leave one of the partners lead communications. The point is, seldom is communications and reporting approached and managed strategically. And yet, when it is, it can be a critical component of success for the project and for the company sponsoring it. Our presence on site, coupled with our extensive training experience can provide a valuable opportunity for training and team-building, even helping to resolve long-standing issues with external stakeholders and partners. Some clients have us organize training sessions and workshops for corporate staff and some opt to include external partners from the community, government and other stakeholders. There can be value in all of these. First, the training helps to bring a common understanding and awareness of CSR and sustainability that may not be present. It helps everyone to see things from different perspectives and understand issues differently. Almost as important, it can help to build team and common ground between the CSR team and participants from other areas of the corporation. And, finally, spending a day learning and working together with the dynamics of an ongoing project sitting in front of them can help corporate, community and government stakeholders to enhance their relationships and better understand their respective perspectives. Role-playing scenarios are especially effective for this. When we set up a Fresh Eyes à Fresh Insights Analysis we provide the opportunity to deliver training on site if that is something the client wants. The project will be led by Wayne Dunn, President & Founder of the CSR Training Institute and Professor of Practice in Corporate Social Responsibility at McGill University. He is a Stanford University Sloan Fellow with a M.Sc. in Management from the Stanford University Graduate School of Business. He is a CSR and social license pioneer and a veteran of 25+ years and 70+ projects in the space where business meets society, including numerous Fresh Eyes à Fresh Insights analysis in the mining and extractive sector.. His experience encompasses award winning global CSR and sustainability work including industry projects, CSR strategy and CSR Policy. He has hands-on industrial experience including in mineral exploration (diamond drilling, seismic, prospecting), heavy equipment, logging and commercial fishing. He has also worked directly for and with local communities, NGOs, Governments and international organizations. 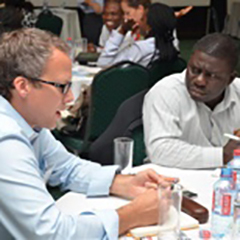 Combined, these experiences and skills enable him to absorb and understand various perspectives and engage effectively with an incredibly broad cross-section of project stakeholders. 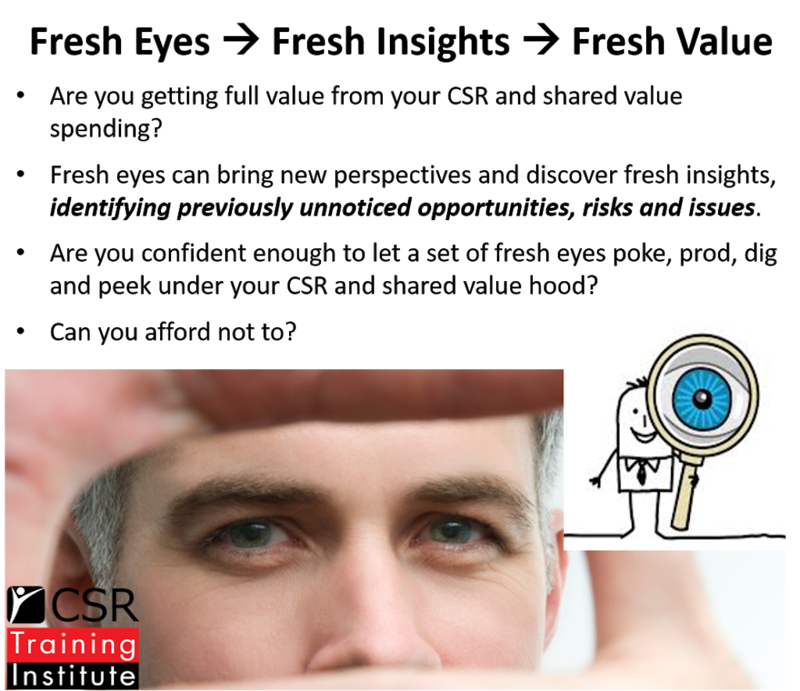 If a Fresh Eyes à Fresh Insights analysis is something your operation might be interested in please contact Wayne Dunn (wayne@csrtraininginstitute.com) to begin discussing scope, timing, budget and logistics.